"There is the case where you recollect the Tathagata: 'Indeed, the Blessed One is worthy and rightly self-awakened, consummate in knowledge and conduct, well-gone, an expert with regard to the world, unexcelled as a trainer for those people fit to be tamed, the Teacher of divine and human beings, awakened, blessed.' At any time when a disciple of the noble ones is recollecting the Tathagata, his mind is not overcome with passion, not overcome with aversion, not overcome with delusion. His mind heads straight, based on the Tathagata. And when the mind is headed straight, the disciple of the noble ones gains a sense of the goal, gains a sense of the Dhamma, gains joy connected with the Dhamma. In one who is joyful, rapture arises. In one who is rapturous, the body grows calm. One whose body is calmed experiences ease. In one at ease, the mind becomes concentrated. Below is the text of the guided meditation we use at our monastery to help us remember the meaning of all of the Buddha's qualities. It is helpful if we can first memorize the list of his nine qualities in Pali and their English meaning. That can form the framework to remember the specific meaning of each quality. If we have not memorized this list and the meaning of each quality, we can easily glance down at a printed copy until we have them committed to memory. Nammo tassa bhagavato arahato sammāsambuddhassa! Homage to the Blessed One, the Worthy One, the Fully Enlightened One! I go for refuge to the Supreme Buddha, my great Teacher. The Supreme Buddha eradicated sensual desires, and was entirely free of sensual desires. The Supreme Buddha eradicated hatred, and was entirely free of hatred. The Supreme Buddha eradicated delusion, and was entirely free of delusion. The Supreme Buddha eradicated all defilements and all unwholesome thoughts, speech and actions. The Supreme Buddha did not commit any misdeeds, even in secrecy. The Supreme Buddha eradicated the desire for seeing forms. The Supreme Buddha eradicated the desire for hearing sounds. The Supreme Buddha eradicated the desire for smelling odors. The Supreme Buddha eradicated the desire for tasting flavours. The Supreme Buddha eradicated the desire for touching tangibles. The Supreme Buddha eradicated the desire for cognizing thoughts. The Supreme Buddha guarded sense faculties, controlled sense faculties, tamed sense faculties and restrained sense faculties. My great Teacher, the Supreme Buddha completely destroyed all taints and was fully purified in body, speech and mind. The Supreme Buddha, alone, understood perfectly the truth of suffering, without anyone’s help. The Supreme Buddha, alone, eradicated the origin of suffering, without anyone’s help. The Supreme Buddha, alone, attained the cessation of suffering, without anyone’s help. The Supreme Buddha, alone, developed the path leading to the cessation of suffering, without anyone’s help. The Supreme Buddha, alone, realized the Four Noble Truths, without anyone’s help. The Supreme Buddha understood the Four Noble Truths as they really are, in their three phases (satya ñana, krutya ñana, kruta ñana) and twelve aspects, without the help of a teacher. The Supreme Buddha, my great Teacher, is the one and only Teacher, who alone realized the Four Noble Truths, escaped suffering, and achieved real happiness. Iddhivida ñāna: The Supreme Buddha had the supernatural powers of creating whatever he wished (having been one, to become many; having been many, to become one; to appear and disappear; to move unhindered through walls and mountains, as though through space; to dive in and out of the Earth, as though it was water; to walk on water, as though it was Earth; seated cross-legged, to travel in the air like birds; to touch and stroke the Sun and Moon). Powerful and mighty was the Supreme Buddha, so as to exercise mastery even as far as the Brahma-world. 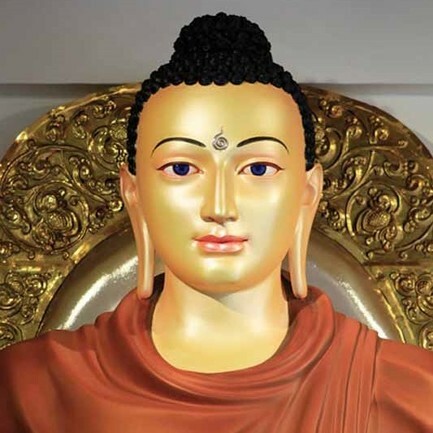 Dibba sota—Divine ear: The Supreme Buddha had the ability to hear both divine and human sounds that were far away, as well as those that were near. Dibba chakku—Divine eye: The Supreme Buddha had the ability to see even the smallest of things at a great distance by his divine eye. Paracittavijānana ñāna: The Supreme Buddha had the ability to read others’ minds. Pubbenivāsānussati ñāna: The Supreme Buddha had the ability to recollect the past lives of beings. Cutūpapāta ñāna: The Supreme Buddha had the ability to see the passing away and rebirth of beings according to their actions. Āsavakkhaya ñāna: The Supreme Buddha had the knowledge of the destruction of all taints. The Supreme Buddha developed excellent psychic powers. My great Teacher, the Supreme Buddha had excellent virtue, excellent concentration, excellent wisdom, excellent mindfulness; extraordinary effort, courage and determination. The Supreme Buddha discovered the correct and clear path, the Noble Eightfold Path. Following the Noble Eightfold Path, my great Teacher achieved the bliss of Nibbāna. The Supreme Buddha understood all worlds – the Brahma world, the heavenly world, the human world, hell, the animal world, the ghost world, and the titans’ world. The Supreme Buddha understood the origin of all worlds and escaped from all worlds. With great compassion, loving kindness, and great wisdom, the Supreme Buddha tamed immoral humans, gods and Brahmas, to be moral and virtuous. The Supreme Buddha is the Teacher of gods and humans. The Supreme Buddha showed wise gods and wise humans the way to end suffering and reach Nibbāna. Supreme Buddha, with great compassion, expounded the Dhamma to others without holding anything back, so that they may understand suffering and achieve real happiness. The Supreme Buddha is the one and only extraordinary, supreme Teacher with all of these great qualities. These are the great qualities of the Supreme Buddha, my great Teacher. My refuge is based on these exceptional qualities and the incomparable virtue, concentration, and wisdom of the Supreme Buddha. My great Teacher has taught us, when a noble son or daughter recollects the qualities of the Blessed One, the mind of the noble disciple is not afflicted with sensual desire, with hatred or with delusion. The mind becomes unshaken towards the Supreme Buddha. With perfect confidence in the Blessed One, inspiration is gained from the truth of the Dhamma. Gladness arises in the noble disciple. With gladness towards the Dhamma, rapture and joy are born. With joy, the body becomes tranquil. With a tranquil body, the noble disciple feels pleasure. With pleasure, the mind becomes concentrated. The noble disciple abides recollecting the great qualities of the Supreme Buddha, the Blessed One, my great Teacher.